The winners of the World Superyacht Awards 2017 were announced at a glittering ceremony held at the Palazzo Vecchio in Florence in May 2017. Click through to see all the winners. This year, nine motor yachts – the winners of each of the motor yacht classes – competed for the coveted title of Motor Yacht of the Year. When deciding this award, the difficulty of comparing such diverse yachts is always a hard task for the judges, but they are always aware that they are seeking the ‘very best of the best’ – a vessel that is truly extraordinary by any measure. As such, it was clear that Dilbar had to take the title. Not only is she arguably the most complex and challenging yacht ever to be built, but she is also the largest ever built in terms of gross tonnage. All aspects of her design and construction were, in the unanimous view of those judges who had visited her, quite superb. The quality of construction of her interior, which uses rare materials and striking surface finishes in abundance, is truly spectacular, as is the indoor swimming pool with a capacity of 180 cubic metres, the largest ever installed on a yacht. This yacht is a worthy winner. The winners of the World Superyacht Awards 2017 were announced at a glittering ceremony held at the Palazzo Vecchio in Florence in May 2017. Click through to see all the winners. This year, nine motor yachts – the winners of each of the motor yacht classes – competed for the coveted title of Motor Yacht of the Year. When deciding this award, the difficulty of comparing such diverse yachts is always a hard task for the judges, but they are always aware that they are seeking the ‘very best of the best’ – a vessel that is truly extraordinary by any measure. As such, it was clear that Dilbar had to take the title. Not only is she arguably the most complex and challenging yacht ever to be built, but she is also the largest ever built in terms of gross tonnage. All aspects of her design and construction were, in the unanimous view of those judges who had visited her, quite superb. The quality of construction of her interior, which uses rare materials and striking surface finishes in abundance, is truly spectacular, as is the indoor swimming pool with a capacity of 180 cubic metres, the largest ever installed on a yacht. This yacht is a worthy winner. The choice of Sailing Yacht of the Year was between two very different yachts – My Song, the extremely fast yet at the same time elegant racer/cruiser that has already demonstrated its winning abilities in competition, and Sybaris, an ultra-large yacht designed to cruise the extremities of the world in comfort. It was a difficult decision, but when the ballot was counted it was Sybaris that came out on top, being a ground-breaking world class sailing yacht. Sybaris not only impressed the judges with its sailing ability – particularly in light airs when many yachts of this size resort to mechanical power – but also in the yacht’s supreme comfort and optimum division of internal volume that entirely suits the owner’s needs. Some technical innovations have already been mentioned, but there are more in that the sail plan, rig and underwater appendages were subjected to extensive CFD testing, which allowed detailed optimisation of rig, hull shape and appendages. 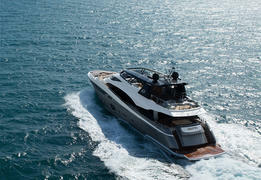 Beautiful, capable, comfortable, and technically advanced this is a yacht that was considered supreme for its purpose. The choice of Sailing Yacht of the Year was between two very different yachts – My Song, the extremely fast yet at the same time elegant racer/cruiser that has already demonstrated its winning abilities in competition, and Sybaris, an ultra-large yacht designed to cruise the extremities of the world in comfort. It was a difficult decision, but when the ballot was counted it was Sybaris that came out on top, being a ground-breaking world class sailing yacht. Sybaris not only impressed the judges with its sailing ability – particularly in light airs when many yachts of this size resort to mechanical power – but also in the yacht’s supreme comfort and optimum division of internal volume that entirely suits the owner’s needs. Some technical innovations have already been mentioned, but there are more in that the sail plan, rig and underwater appendages were subjected to extensive CFD testing, which allowed detailed optimisation of rig, hull shape and appendages. 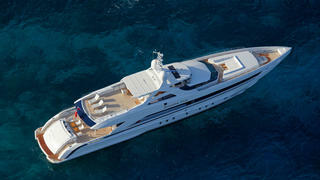 Beautiful, capable, comfortable, and technically advanced this is a yacht that was considered supreme for its purpose. There were three entries in this year’s Voyager’s Award and as the judges considered them all to be of high merit, the task of selecting a winner was not easy. But a winner had to be selected and the judges homed in upon a particularly well-planned cruise by the 49 metre Glaze, which is currently engaged on a circumnavigation with the owners and their young family. The element of this cruise submitted to the jury was in North West Australia, between Wyndham and Broome, where they visited the remote, spectacular and extremely rugged coastline known as The Kimberleys. This adventure-packed cruise explored the region’s many inlets and rivers, mostly poorly or totally uncharted, and included many sightings of crocodiles and sharks, as well as experiences such as dipping their yacht’s bows in waterfalls tumbling down the vertical red cliffs, whirlpools, tidal rapids, and visits to Aboriginal cave art, and even the well-preserved remains of a DC3 aircraft downed in WWII. This voyage will surely be an inspiration to all who follow. There were three entries in this year’s Voyager’s Award and as the judges considered them all to be of high merit, the task of selecting a winner was not easy. But a winner had to be selected and the judges homed in upon a particularly well-planned cruise by the 49 metre Glaze, which is currently engaged on a circumnavigation with the owners and their young family. The element of this cruise submitted to the jury was in North West Australia, between Wyndham and Broome, where they visited the remote, spectacular and extremely rugged coastline known as The Kimberleys. 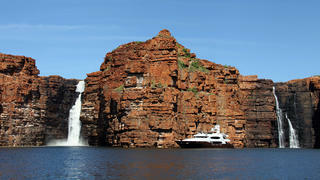 This adventure-packed cruise explored the region’s many inlets and rivers, mostly poorly or totally uncharted, and included many sightings of crocodiles and sharks, as well as experiences such as dipping their yacht’s bows in waterfalls tumbling down the vertical red cliffs, whirlpools, tidal rapids, and visits to Aboriginal cave art, and even the well-preserved remains of a DC3 aircraft downed in WWII. This voyage will surely be an inspiration to all who follow. 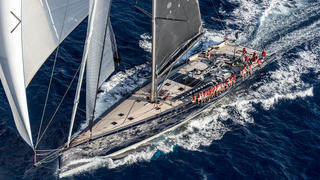 This year’s event saw eight yachts enter the Refit Class. The judges noted that while all had been subjected to worthy ‘end of season’ maintenance, repair and improvement, they were seeking a winner from among those who had either completed visionary upgrades, or whose endeavours had resulted in significant improvements. The entry that stood out from the crowd was that carried out to the 85 metre Aquila, formerly Cakewalk, whose owners chose to refit an existing yacht to suit their anticipated use and decorative taste, rather than wait five years for a new-build to be delivered. 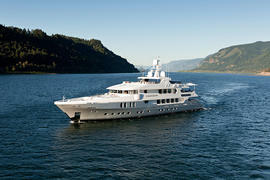 At the same time the yacht’s five-year survey and significant technical upgrades were also undertaken. 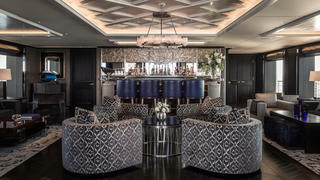 This extensive work, undertaken by Pendennis Shipyard in Falmouth, England, with interior design and decoration by RWD and Susan Young Interiors over a twelve month period was, in the judges opinion carried out to exemplary standards, with the result fully meeting the owners brief. Today, unrecognisable from her former self, Aquila is the pride of her new owners. This year’s event saw eight yachts enter the Refit Class. The judges noted that while all had been subjected to worthy ‘end of season’ maintenance, repair and improvement, they were seeking a winner from among those who had either completed visionary upgrades, or whose endeavours had resulted in significant improvements. The entry that stood out from the crowd was that carried out to the 85 metre Aquila, formerly Cakewalk, whose owners chose to refit an existing yacht to suit their anticipated use and decorative taste, rather than wait five years for a new-build to be delivered. 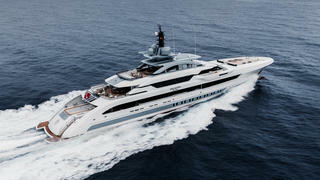 At the same time the yacht’s five-year survey and significant technical upgrades were also undertaken. This extensive work, undertaken by Pendennis Shipyard in Falmouth, England, with interior design and decoration by RWD and Susan Young Interiors over a twelve month period was, in the judges opinion carried out to exemplary standards, with the result fully meeting the owners brief. Today, unrecognisable from her former self, Aquila is the pride of her new owners. Legend, one of the three yachts entered for this year’s Rebuilt category stood out from the others. When an owner’s objective is to create a world-roaming expedition yacht with Lloyds A1 Ice Class, and Polar classification, an ex-Russian tug is a pretty good starting point, despite the vessel being 34 years old. This vessel had already been converted into a superyacht but the new owner’s additional requirement for full SOLAS and MCA 13-36 passenger status meant that only the hull, which was extended by 3.6 metres with a remodelled stern to incorporate a bathing platform and 16-person swimming pool, and her main engines could remain intact. The superstructure was modified to soften her lines but perhaps the most difficult aspects of the rebuild, which was carried out by ICON Yachts, was the installation of a fully classified helipad with refuelling facilities while bringing her into SOLAS compliance. In the view of the judges, this was a highly successful rebuild that readied her for operations in high-latitudes, where she has already cruised. Judges’ Commendation: RH3 This top-to-toe rethinking of a proven explorer into a comfortable, intimate family yacht that will soon embark on a circumnavigation brought RH3 a worthy commendation from the judges. Legend, one of the three yachts entered for this year’s Rebuilt category stood out from the others. When an owner’s objective is to create a world-roaming expedition yacht with Lloyds A1 Ice Class, and Polar classification, an ex-Russian tug is a pretty good starting point, despite the vessel being 34 years old. This vessel had already been converted into a superyacht but the new owner’s additional requirement for full SOLAS and MCA 13-36 passenger status meant that only the hull, which was extended by 3.6 metres with a remodelled stern to incorporate a bathing platform and 16-person swimming pool, and her main engines could remain intact. The superstructure was modified to soften her lines but perhaps the most difficult aspects of the rebuild, which was carried out by ICON Yachts, was the installation of a fully classified helipad with refuelling facilities while bringing her into SOLAS compliance. In the view of the judges, this was a highly successful rebuild that readied her for operations in high-latitudes, where she has already cruised. This top-to-toe rethinking of a proven explorer into a comfortable, intimate family yacht that will soon embark on a circumnavigation brought RH3 a worthy commendation from the judges. Six yachts entered this class, all of which were suitable for either superyacht racing or blue water cruising. The judges were therefore faced with a difficult choice in selecting a victor, but after lengthy discussion and careful consideration the secret ballot revealed the winner to be the 39.62 metre, My Song built by Baltic Yachts. Packed with cutting-edge design and technology this yacht was conceived by Nauta, who drew both her eye-catching exterior and her interior, while naval architecture and structural engineering was tackled by Reichel Pugh assisted by Gurit. In view of this legendary team, the judges were unsurprised that this yacht performs so well on the race track, regularly reaching 20+ knots and boasting a top-speed in excess of 30-knots in optimum conditions. But perhaps more surprising to the judges was that she is also a comfortable, feature-filled cruising yacht with excellent facilities for on-deck and below-deck dining and relaxing, as well as three well-sized ensuite guest cabins, and an admirable crew area for six in the stern. 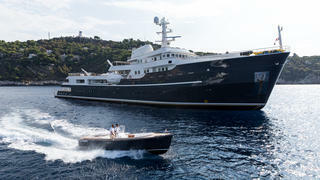 Six yachts entered this class, all of which were suitable for either superyacht racing or blue water cruising. The judges were therefore faced with a difficult choice in selecting a victor, but after lengthy discussion and careful consideration the secret ballot revealed the winner to be the 39.62 metre, My Song built by Baltic Yachts. Packed with cutting-edge design and technology this yacht was conceived by Nauta, who drew both her eye-catching exterior and her interior, while naval architecture and structural engineering was tackled by Reichel Pugh assisted by Gurit. In view of this legendary team, the judges were unsurprised that this yacht performs so well on the race track, regularly reaching 20+ knots and boasting a top-speed in excess of 30-knots in optimum conditions. But perhaps more surprising to the judges was that she is also a comfortable, feature-filled cruising yacht with excellent facilities for on-deck and below-deck dining and relaxing, as well as three well-sized ensuite guest cabins, and an admirable crew area for six in the stern. Both yachts that qualified for this class were of extraordinary size, with one measuring 70 metres LOA and the second a massive 86 metres. The task of deciding the winner had been made easier by the large number of judges that had visited each yacht, but both yachts had impressed them and both yachts performed well under sail, so the decision was still a difficult one. 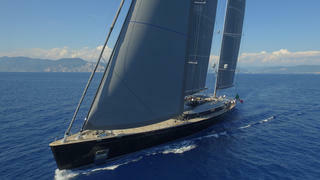 But when the ballot sheets were counted it was the 70 metre Perini Navi Sybaris that triumphed. Her owner’s chosen designers working with the builder’s own talented in-house teams provided an impressive interpretation of the owner’s request for elegant low-profiled styling, uninterrupted internal volumes, and wide views of the water, and these elements impressed the judges. Realising a sailing yacht of this size called for technical innovation and the judges complemented the builder for the high performance electric winches and furlers that were crucial to this vessel’s sailing ability, while eco-friendly variable-speed generators that keep generator revolutions to a minimum in times of low demand added to the yacht’s appeal. Both yachts that qualified for this class were of extraordinary size, with one measuring 70 metres LOA and the second a massive 86 metres. The task of deciding the winner had been made easier by the large number of judges that had visited each yacht, but both yachts had impressed them and both yachts performed well under sail, so the decision was still a difficult one. But when the ballot sheets were counted it was the 70 metre Perini NaviSybaris that triumphed. Her owner’s chosen designers working with the builder’s own talented in-house teams provided an impressive interpretation of the owner’s request for elegant low-profiled styling, uninterrupted internal volumes, and wide views of the water, and these elements impressed the judges. Realising a sailing yacht of this size called for technical innovation and the judges complemented the builder for the high performance electric winches and furlers that were crucial to this vessel’s sailing ability, while eco-friendly variable-speed generators that keep generator revolutions to a minimum in times of low demand added to the yacht’s appeal. The judges commented that this was a diverse class comprised of ultra high-speed two-deck sports boats, as well as raised pilot house and three-deck vessels, thus increasing the difficulty of comparing individual yachts. Additionally, three of the yachts were of the same basic design that inevitably required the judges to consider the individual style of interior decoration in more detail than usual. The yacht that came to the fore following the usual secret-ballot vote was Botti, a 32.6 metre raised pilot house design, built from advanced composites by Monte Carlo Yachts. Her elegant exterior design permits a large bimini-covered sundeck with dining and lounging and a second dining area on the main deck aft, while the design makes use of the foredeck as a further lounging space and cinema. A sizeable bathing platform adds to the appeal. Inside, the judges admired the clean, practical lines and subdued decorative scheme. The technical spaces were considered well-constructed, especially the engine room that houses twin MTU diesels and practical gyro-stabilisers that afford low speed stability. Judges’ Commendation: Kohuba The judges felt that Kohuba demonstrated Princess Yacht’s commitment to delivering a vessel of custom-built standards in a semi-custom series, and felt that this yard deserved praise for its high quality design and build process. Judges’ Commendation: Spectre This stylish yacht’s top speed of over 50-knots wowed the panel, as did Spectre's superb finish. To pack so much power into a solid yet lightweight platform is difficult, and the judges commended them for this achievement. The judges commented that this was a diverse class comprised of ultra high-speed two-deck sports boats, as well as raised pilot house and three-deck vessels, thus increasing the difficulty of comparing individual yachts. Additionally, three of the yachts were of the same basic design that inevitably required the judges to consider the individual style of interior decoration in more detail than usual. The yacht that came to the fore following the usual secret-ballot vote was Botti, a 32.6 metre raised pilot house design, built from advanced composites by Monte Carlo Yachts. Her elegant exterior design permits a large bimini-covered sundeck with dining and lounging and a second dining area on the main deck aft, while the design makes use of the foredeck as a further lounging space and cinema. A sizeable bathing platform adds to the appeal. Inside, the judges admired the clean, practical lines and subdued decorative scheme. The technical spaces were considered well-constructed, especially the engine room that houses twin MTU diesels and practical gyro-stabilisers that afford low speed stability. The judges felt that Kohuba demonstrated Princess Yacht’s commitment to delivering a vessel of custom-built standards in a semi-custom series, and felt that this yard deserved praise for its high quality design and build process. This stylish yacht’s top speed of over 50-knots wowed the panel, as did Spectre's superb finish. To pack so much power into a solid yet lightweight platform is difficult, and the judges commended them for this achievement. The appearance of a yacht is always an important factor and the judges were drawn to Gipsy, a three-deck 35 metre aluminium-built yacht, for her clean ‘no nonsense’ exterior lines, together with the highly practical optimisation of her exterior spaces. They also felt that her top speed of 20 knots and 2,000 nautical mile range at a cruising speed of 11-knots further added to this appeal. A more detailed examination of the yacht revealed a high volume, thoughtfully laid-out interior that positions the dining area forward on the main deck and the owner’s cabin aft of the bridge, and one that also provides good access between the crew and guest areas on the lower deck to aid the servicing of the cabins. A stylishly modern style of interior decoration perfectly complements her exterior lines, particularly the highly functional main saloon that incorporates a movie theatre. The judges considered that this compact but extremely well designed yacht, which completely meets the needs of her experienced owner, is a worthy winner in this class. The appearance of a yacht is always an important factor and the judges were drawn to Gipsy, a three-deck 35 metre aluminium-built yacht, for her clean ‘no nonsense’ exterior lines, together with the highly practical optimisation of her exterior spaces. They also felt that her top speed of 20 knots and 2,000 nautical mile range at a cruising speed of 11-knots further added to this appeal. A more detailed examination of the yacht revealed a high volume, thoughtfully laid-out interior that positions the dining area forward on the main deck and the owner’s cabin aft of the bridge, and one that also provides good access between the crew and guest areas on the lower deck to aid the servicing of the cabins. A stylishly modern style of interior decoration perfectly complements her exterior lines, particularly the highly functional main saloon that incorporates a movie theatre. The judges considered that this compact but extremely well designed yacht, which completely meets the needs of her experienced owner, is a worthy winner in this class. This class tested the judges’ analytical skills and every yacht was treated to detailed scrutiny and discussion. 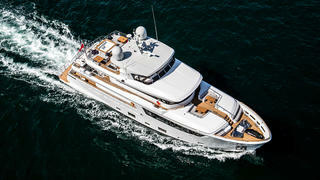 Following this, the secret ballot proved the 45 metre Heesen Amore Mio to be their favourite. The judges admired the versatility of this vessel, which offers an unusual blend of 30-knot performance and a 2,750 nautical mile range at its 12-knot cruising speed. Her owners’ requested a ‘summer house on the sea’ and the judges felt this to be well met, with spacious open decks offering admirable dining and lounging areas on two levels aft, while the foredeck offers additional sun-lounging and seating. With so much space devoted to outside areas, the interior layout had to make intelligent use of every available square metre, and the judges felt that this was achieved without compromising either the guest or crew quarters. The technical aspects of the yacht were also praised, particularly the build quality, the gyro-stabilisers that provide low speed and ‘at anchor’ stability, and the possibility to deploy life preservers at the push of a button. This class tested the judges’ analytical skills and every yacht was treated to detailed scrutiny and discussion. 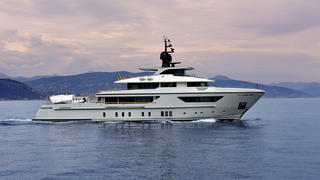 Following this, the secret ballot proved the 45 metre HeesenAmore Mio to be their favourite. The judges admired the versatility of this vessel, which offers an unusual blend of 30-knot performance and a 2,750 nautical mile range at its 12-knot cruising speed. Her owners’ requested a ‘summer house on the sea’ and the judges felt this to be well met, with spacious open decks offering admirable dining and lounging areas on two levels aft, while the foredeck offers additional sun-lounging and seating. With so much space devoted to outside areas, the interior layout had to make intelligent use of every available square metre, and the judges felt that this was achieved without compromising either the guest or crew quarters. The technical aspects of the yacht were also praised, particularly the build quality, the gyro-stabilisers that provide low speed and ‘at anchor’ stability, and the possibility to deploy life preservers at the push of a button. This vessel is an example of a newly developed category of fast yachts whose hull form provides optimum performance at both full displacement speeds and well above. Whether this 30-knot yacht has a full-displacement or a semi-displacement hull is arguable, but it has been placed in the Semi-Displacement Class for this event because, being a high performance vessel, she shares a semi-displacement yacht’s need for lightness of construction, in that any excess of weight will seriously detract from her performance. Given this decision, the judges also felt that, because Galactica Super Nova is 20 metres longer than the next largest yacht in her class and therefore able to pack in far more luxury, it was impossible to compare her with the smaller boats. She was, therefore, put into her own category and the judges applied the test of whether she is worthy of a Neptune. In view of her build quality, appearance and high level of superb facilities, she passed this test with flying colours and was rewarded with a Neptune. This vessel is an example of a newly developed category of fast yachts whose hull form provides optimum performance at both full displacement speeds and well above. Whether this 30-knot yacht has a full-displacement or a semi-displacement hull is arguable, but it has been placed in the Semi-Displacement Class for this event because, being a high performance vessel, she shares a semi-displacement yacht’s need for lightness of construction, in that any excess of weight will seriously detract from her performance. Given this decision, the judges also felt that, because Galactica Super Nova is 20 metres longer than the next largest yacht in her class and therefore able to pack in far more luxury, it was impossible to compare her with the smaller boats. She was, therefore, put into her own category and the judges applied the test of whether she is worthy of a Neptune. In view of her build quality, appearance and high level of superb facilities, she passed this test with flying colours and was rewarded with a Neptune. Explorer yachts are often given this name by virtue of their styling, rather than their suitability for long range expeditions in all climates. But the judges found X to be a true explorer – a rugged yacht with a good range that carries the tenders and equipment required for the owner and his family to cross the largest oceans and explore the world in comfort and safety. This well constructed, steel and aluminium vessel is powered by twin 970kW Caterpillar diesels that provide a 15.5 knot top speed, while her 14 knot cruising speed provides the 4,000 nautical mile range necessary for her trans-ocean role. While the main deck aft is devoted to tenders and PWCs, the remaining two decks provide the usual facilities for open air living in a mild climate while in adverse weather, large saloon windows allow guests to view the scenery in comfort. The judges also admired the crew areas that provide accommodation for up to eight as well as ample storage and laundry facilities. This, they believe, is a well-conceived explorer. Explorer yachts are often given this name by virtue of their styling, rather than their suitability for long range expeditions in all climates. But the judges found X to be a true explorer – a rugged yacht with a good range that carries the tenders and equipment required for the owner and his family to cross the largest oceans and explore the world in comfort and safety. This well constructed, steel and aluminium vessel is powered by twin 970kW Caterpillar diesels that provide a 15.5 knot top speed, while her 14 knot cruising speed provides the 4,000 nautical mile range necessary for her trans-ocean role. While the main deck aft is devoted to tenders and PWCs, the remaining two decks provide the usual facilities for open air living in a mild climate while in adverse weather, large saloon windows allow guests to view the scenery in comfort. The judges also admired the crew areas that provide accommodation for up to eight as well as ample storage and laundry facilities. This, they believe, is a well-conceived explorer. This class, which contains the largest vessels of the sub-500 gross ton displacement yachts, is always hotly contested and the judges spent a good deal of time examining all aspects of each entrant before completing their secret-ballot sheets. The results showed La Passion, the first vessel to be launched from the Turkish-based SARP Yachts, to be the narrow winner. This is not only a particularly noteworthy achievement for a new yard, but one that rewarded their dedication to ‘getting everything right’ before exhibiting their product. In the judges’ view, La Passion has steered a well-considered course through the minefield of decisions that lie in the route to a successful yacht. The judges admired almost every aspect of this well-considered vessel, from the world-roaming seaworthiness and efficiency of the hull, to the quality of construction of its steel hull and GRP superstructure and the clean simplicity of its appearance. The layout of the deck areas, and the elegantly modern interior design were also strong points. This new yard has announced its arrival in grand style. Judges’ Commendation: Domani The fifth yacht to be built by Benetti for this knowledgeable owner, Domani is an excellent example of good craftsmanship and the yard’s ability to satisfy the owner’s exact wishes. The judges considered her to be worthy of a Commendation. This class, which contains the largest vessels of the sub-500 gross ton displacement yachts, is always hotly contested and the judges spent a good deal of time examining all aspects of each entrant before completing their secret-ballot sheets. The results showed La Passion, the first vessel to be launched from the Turkish-based SARP Yachts, to be the narrow winner. This is not only a particularly noteworthy achievement for a new yard, but one that rewarded their dedication to ‘getting everything right’ before exhibiting their product. In the judges’ view, La Passion has steered a well-considered course through the minefield of decisions that lie in the route to a successful yacht. The judges admired almost every aspect of this well-considered vessel, from the world-roaming seaworthiness and efficiency of the hull, to the quality of construction of its steel hull and GRP superstructure and the clean simplicity of its appearance. The layout of the deck areas, and the elegantly modern interior design were also strong points. This new yard has announced its arrival in grand style. The fifth yacht to be built by Benetti for this knowledgeable owner, Domani is an excellent example of good craftsmanship and the yard’s ability to satisfy the owner’s exact wishes. The judges considered her to be worthy of a Commendation. It was not easy for the judges to select a winner in this class, but the combination of dynamic looks, forward-thinking design and excellence of construction eventually focused their attention on Joy. This yacht’s exterior styling, incorporating many scalloped surfaces and spacious decks, could not have been easy to construct, while the huge expanses of glass would also have tested the builder. But both elements have added to the appeal of this strikingly modern yacht. 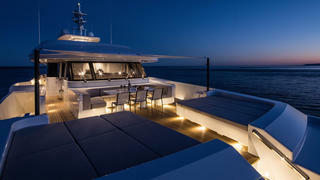 The Judges were particularly impressed with the manner in which all three aft decks could be enclosed with full-height sliding glass panels, thus increasing the interior volume in times of inclement weather. The judges also felt that the interior designer, responding to the owner’s request for a home rather than hotel, created an enviable blend of comfortable modernism and striking design. Technical innovation – in the form of an active noise attenuation system for the gearboxes that keeps internal noise levels much lower than usual when underway - was also praised by the judges. It was not easy for the judges to select a winner in this class, but the combination of dynamic looks, forward-thinking design and excellence of construction eventually focused their attention on Joy. This yacht’s exterior styling, incorporating many scalloped surfaces and spacious decks, could not have been easy to construct, while the huge expanses of glass would also have tested the builder. But both elements have added to the appeal of this strikingly modern yacht. The Judges were particularly impressed with the manner in which all three aft decks could be enclosed with full-height sliding glass panels, thus increasing the interior volume in times of inclement weather. The judges also felt that the interior designer, responding to the owner’s request for a home rather than hotel, created an enviable blend of comfortable modernism and striking design. Technical innovation – in the form of an active noise attenuation system for the gearboxes that keeps internal noise levels much lower than usual when underway - was also praised by the judges. Today, most yachts are similar in their layout so it is quite unusual to come across a yacht specifically designed for a task that reaches beyond this norm. The judges immediately identified Cloudbreak as such a yacht and she became the focus of their attention. This yacht was created for, and by, an owner who knew exactly what he wanted – to be an explorer-styled vessel tailored to his wish to practice adventure sports on land and sea at both low and high latitudes – and this unique yacht is specifically designed to support mountaineering and hiking, as well as snow sports of all disciplines. Operating in remote areas calls for fully certified helicopter facilities as well as a wide range of tenders and toys, and a fully equipped ski-room that would not be out of place in Zermatt. Combine this with exterior design and interior layout by Espen Oeino, and interior design by Christian Liaigre and add the legendary build quality of Abeking & Rasmussen and the resulting yacht is very special. Today, most yachts are similar in their layout so it is quite unusual to come across a yacht specifically designed for a task that reaches beyond this norm. The judges immediately identified Cloudbreak as such a yacht and she became the focus of their attention. This yacht was created for, and by, an owner who knew exactly what he wanted – to be an explorer-styled vessel tailored to his wish to practice adventure sports on land and sea at both low and high latitudes – and this unique yacht is specifically designed to support mountaineering and hiking, as well as snow sports of all disciplines. Operating in remote areas calls for fully certified helicopter facilities as well as a wide range of tenders and toys, and a fully equipped ski-room that would not be out of place in Zermatt. Combine this with exterior design and interior layout by Espen Oeino, and interior design by Christian Liaigre and add the legendary build quality of Abeking & Rasmussen and the resulting yacht is very special. The rules of the event dictate that should only one yacht be entered in a class, this class is amalgamated with the most appropriate alternative. Dilbar, being the only vessel to qualify for the ‘Displacement Yachts of above 3,000 GT’ class, was therefore placed in the class below. But when it came to judging, the judges decided that it was impossible to fairly decide a winner for this class when Dilbar was seven times larger in terms of Gross Tonnage (a measure of internal volume) than Cloudbreak, the next largest yacht. A similar situation had occurred in the past when it was decided that a Neptune would only be awarded if the lone yacht was truly worthy of an award, and this precedent was followed. Ten judges had visited Dilbar and they were all sure that not only was she worthy of a Neptune, but she was also the most spectacular yacht they had ever seen. 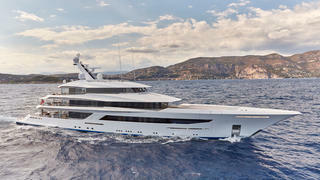 Put to a vote, it was unanimously decided that this award should be presented to Dilbar. The rules of the event dictate that should only one yacht be entered in a class, this class is amalgamated with the most appropriate alternative. Dilbar, being the only vessel to qualify for the ‘Displacement Yachts of above 3,000 GT’ class, was therefore placed in the class below. But when it came to judging, the judges decided that it was impossible to fairly decide a winner for this class when Dilbar was seven times larger in terms of Gross Tonnage (a measure of internal volume) than Cloudbreak, the next largest yacht. A similar situation had occurred in the past when it was decided that a Neptune would only be awarded if the lone yacht was truly worthy of an award, and this precedent was followed. Ten judges had visited Dilbar and they were all sure that not only was she worthy of a Neptune, but she was also the most spectacular yacht they had ever seen. 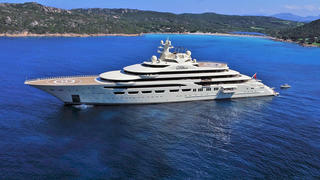 Put to a vote, it was unanimously decided that this award should be presented to Dilbar. The judges were impressed by the design, build quality and price of Narvalo, which they felt was a perfect example of a ‘pocket explorer yacht’ that combines sought-after characteristics with excellent value for money. Built by Cantiere delle Marche to a design by Nauta and naval architecture by Hydrotec, Narvalo offers all the essential elements of an explorer, including long range, good autonomy in respect of supplies that allows her to remain at sea for extended periods, high internal volume, a sturdy and well equipped 5.5 metre tender and good seaworthiness. 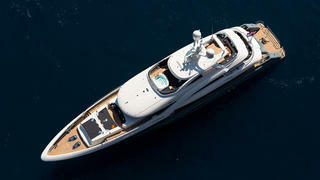 On top of this, she can also fill the role of a traditional motor yacht, with well-sized cabins, an internal dining saloon and two lounges, as well as spacious well considered deck areas. Importantly for a vessel that will remain at sea for long periods, the volume and facilities of the crew spaces provided in a yacht of this size, were also admired by the judges. Finishing second in her class to a much more costly vessel, she is a worthy winner of this award. The judges were impressed by the design, build quality and price of Narvalo, which they felt was a perfect example of a ‘pocket explorer yacht’ that combines sought-after characteristics with excellent value for money. Built by Cantiere delle Marche to a design by Nauta and naval architecture by Hydrotec, Narvalo offers all the essential elements of an explorer, including long range, good autonomy in respect of supplies that allows her to remain at sea for extended periods, high internal volume, a sturdy and well equipped 5.5 metre tender and good seaworthiness. On top of this, she can also fill the role of a traditional motor yacht, with well-sized cabins, an internal dining saloon and two lounges, as well as spacious well considered deck areas. Importantly for a vessel that will remain at sea for long periods, the volume and facilities of the crew spaces provided in a yacht of this size, were also admired by the judges. Finishing second in her class to a much more costly vessel, she is a worthy winner of this award. 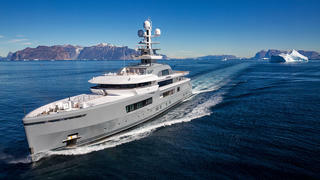 Chasseur is the first yacht to be launched from Christensen following the reopening of the yard, and while this vessel did not top its class, the judges felt her worthy of a Special Award for Achievement in view of her wide ranging virtues and the admirable quality of her build that was carried out in difficult circumstances. Considering her one of the best vessels ever to leave the Christensen yard, they took note of her robust and seaworthy GRP hull which, powered by twin 1,650hp Caterpillars, achieves a top speed of 16-knots and a 4,000nm range at her 10-knot cruising speed. They also praised her sleekly modern exterior lines and her vibrant, light and bright three-deck interior that is linked by an intriguingly lit, cantilevered glass staircase. The well-sized crew quarters incorporate a sizeable walk-in freezer/refrigerator room, whose volume complements her long range capabilities. The road to Chasseur’s launch might have been a rocky one, but the owner now has the elegant, modernist yacht that he sought. Very little quietens a room full of superyacht owners who are debating the merits of superyacht design and construction, and the debate sometimes reaches fever pitch. There was one thing, however, that managed to still them utterly – the remarkable footage of last year’s Voyagers Award winner, Anil Thadani’s latest cruise around the frozen wastes of the Svalbard Archipelago. By employing drones and ensuring that his crew was well stocked with video experts, Anil has managed to produce an absolutely stunning video of his adventure – including being stalked by polar bears, to coming within touching distance of whales and even hula-hooping on ice floes. This is one owner who is not shy to shout about the wonderful world we have to cruise and he demonstrates this in his videos, while offering inspiration and encouragement to any yacht owner who’s ever thought… “what if…”. For his outstanding achievements in the field of video and for making his footage freely available, the judges felt Anil, Shelton Dupreez (an up and coming film maker) and the rest of the crew deserved a special award. To view The Highest Latitude: An Arctic Svalbard Expedition, please click here. Very little quietens a room full of superyacht owners who are debating the merits of superyacht design and construction, and the debate sometimes reaches fever pitch. There was one thing, however, that managed to still them utterly – the remarkable footage of last year’s Voyagers Award winner, Anil Thadani’s latest cruise around the frozen wastes of the Svalbard Archipelago. By employing drones and ensuring that his crew was well stocked with video experts, Anil has managed to produce an absolutely stunning video of his adventure – including being stalked by polar bears, to coming within touching distance of whales and even hula-hooping on ice floes. This is one owner who is not shy to shout about the wonderful world we have to cruise and he demonstrates this in his videos, while offering inspiration and encouragement to any yacht owner who’s ever thought… “what if…”. For his outstanding achievements in the field of video and for making his footage freely available, the judges felt Anil, Shelton Dupreez (an up and coming film maker) and the rest of the crew deserved a special award. 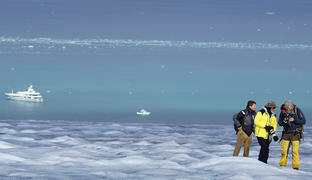 To view The Highest Latitude: An Arctic Svalbard Expedition, please click here. Alex Dreyfoos has been a yacht owner throughout his life, first owning a Rybovich sport-fisherman in 1963, followed by a Burger and a 43.6 metre Feadship. So that his wife Renate could share his ambitions for far-ranging exploration, he investigated a variety of hull-forms that might reduce her suffering from motion sickness and he discovered the SWATH (small waterplane area twin hull) concept and he approached Abeking & Rasmussen, who were not only builders of superb yachts but were also experts in commercial SWATH vessels. Tests confirmed the benefits of this design, and he commissioned A&R to build his current 40.8 metre SWATH superyacht, Silver Cloud. This vessel, in which the owners have enjoyed many adventurous cruises, has proved most successful. Dreyfoos, an MIT and Harvard graduate has earned an Oscar for his technical contribution to the world of motion pictures, holds many patents for innovations in electronics and photography. He is also an arts philanthropist, a scuba diver, an exceptional photographer, and has aided oceanic research by carrying scientific equipment aboard Silver Cloud. Alex Dreyfoos has been a yacht owner throughout his life, first owning a Rybovich sport-fisherman in 1963, followed by a Burger and a 43.6 metre Feadship. So that his wife Renate could share his ambitions for far-ranging exploration, he investigated a variety of hull-forms that might reduce her suffering from motion sickness and he discovered the SWATH (small waterplane area twin hull) concept and he approached Abeking & Rasmussen, who were not only builders of superb yachts but were also experts in commercial SWATH vessels. Tests confirmed the benefits of this design, and he commissioned A&R to build his current 40.8 metre SWATH superyacht, Silver Cloud. This vessel, in which the owners have enjoyed many adventurous cruises, has proved most successful. Dreyfoos, an MIT and Harvard graduate has earned an Oscar for his technical contribution to the world of motion pictures, holds many patents for innovations in electronics and photography. He is also an arts philanthropist, a scuba diver, an exceptional photographer, and has aided oceanic research by carrying scientific equipment aboard Silver Cloud.